A Hialeah homeowner got the shock of his life when they discovered a 13-foot albino Burmese python living in their shed Sunday night. The massive snake was found around 9 p.m. in the 1000 block of W. 60th Street. Luis Eduardo Andano, who had gone to do some work in his backyard shed, said in Spanish that he thought the snake was cloth at first. But when he went to move it, he noticed the head staring back at him. 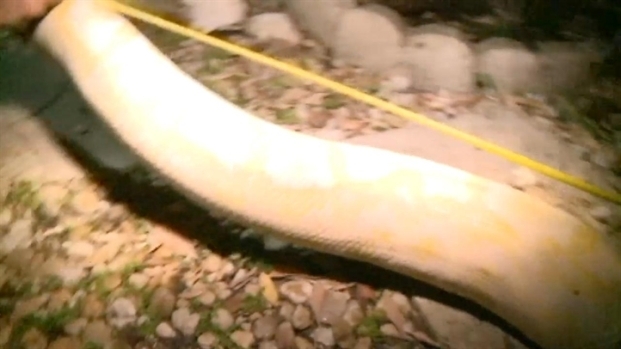 A 13-foot albino Burmese python was found living in a Hialeah homeowner's shed. Authorities remove the massive snake. Lt. Lisa Wood, with the Miami-Dade Fire Rescue Venom Unit said she received a call from Hialeah Police to fetch the python from its cozy home. "It was very nicely holed up in a shed, it's been there a while," Wood said. A massive python find in Hialeah and a tragic incident in Canada have Florida officials warning about python safety. 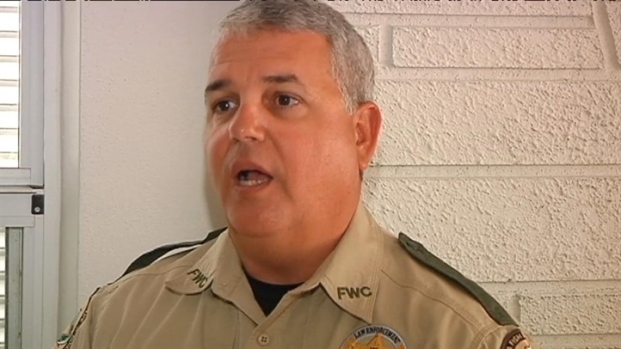 FWC's Jorge Pino and Gonzalo Guayara comment. Wood and other officers were able to grab the 100-pound snake from the shed, where they also found a skin that the snake had shed and a skull. "Speaking with the neighbors, apparently there's a couple of rabbits and a cat missing from the neighborhood recently so the snake may be to blame for that," Wood said. Wood said it's likely that it is someone's escaped pet. NBC 6 was the first to bring you the story of Jason Leon's wrestling bout with a Burmese python in the Everglades, but now the 23 year old's larger than life catch has gone global. Leon and friend Veronica Larios comment. The snake will now be weighed and a report will be submitted to the state, and because it is an albino, it will be retained for educational purposes.